Euphorbia amygdaloides robbiae is a low spreading and running perennial, happy in sun or shade. The Wood Spurge needs only a little extra water in our dry climate to perform, though it will survive quite some time without by going summer dormant. 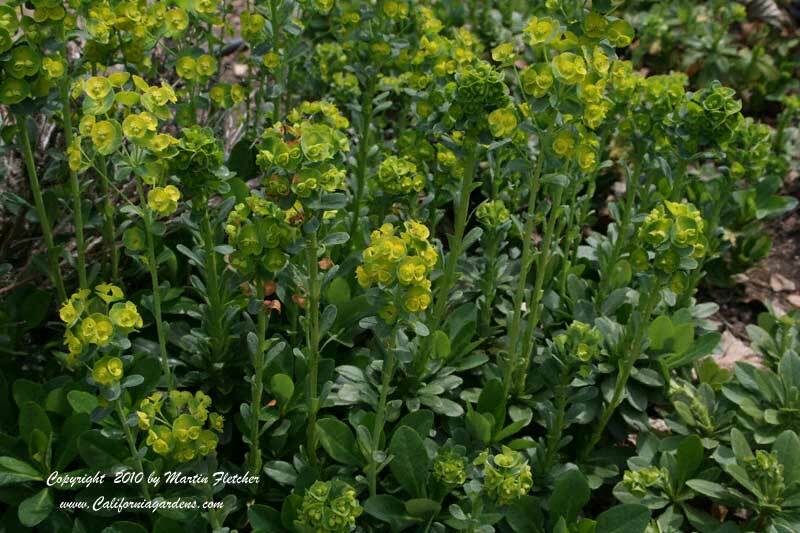 Euphorbia amygdaloides has dark green foliage and lime-yellow flowers in the early to mid Spring. Most of the above ground portion of the stalk dies after blooming. New shoots appear from the base of the stem or from underground. The sap causes skin irritation in some people, and care should be used when trimming the Wood Spurge. Euphorbia amygdaloides robbiae grows to 18" tall and spreads a few inches to a foot in each direction each year. Euphorbia amygdaloides is Winter hardy to zone 5. Lime green flowers of Euphorbia amygdaloides robbiae . High resolution photos are part of our garden image collection.